Dogs are smart. They possess a lot of skills that put them ahead of many of the other species that make up the animal kingdom. One of the many skills that your dog possesses is the ability to communicate with the people around them. While they cannot talk, they find many different ways to express their feelings and one of the ways they speak to us is through their tail. Every action that your dog’s tail makes shows off a different feeling. For instance, when your dog’s tail is unmoving in its natural position, it usually means that the dog is relaxed and content. If you notice that your dog’s tail is lower than usual or it’s tucked under the body, it means that the dog is scared. On the other side of the coin, if the dog’s tail is held higher than usual, then it typically says that the dog is aroused. If the tail is sticking straight out, it can mean that the dog is curious about something in the area. In many cases, when the dog’s tail is wagging, it means that the dog is excited, and the more it wags, the more excited the dog generally is. But the wag of your dog’s tail may mean even more. According to studies over the last several years, researchers have begun to discover that the direction of the wag may display more specific signals. Essentially, they say that a tail that wags to the right then the dog is expressing positive feelings while a movement to the left displays negative feelings. The reason has to do with the dog’s brain and the fact that the brain’s right hemisphere, which is associated with negative feelings, controls the left side of the body while the left hemisphere, which is associated with positive emotions, controls the right side of the body. 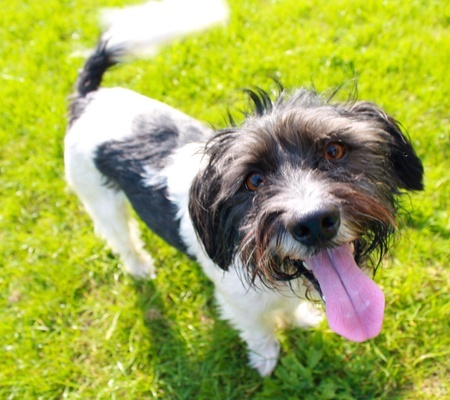 Bet you didn’t know that there was this much to the innocent wagging of your dog’s tail! If you are looking to purchase a smart puppy of your own, visit us here at Pauley’s Pups. We specialize in selling some of the sweetest little dogs in Virginia, and we would love to help you add a faithful companion to your home. Contact us today to learn more!